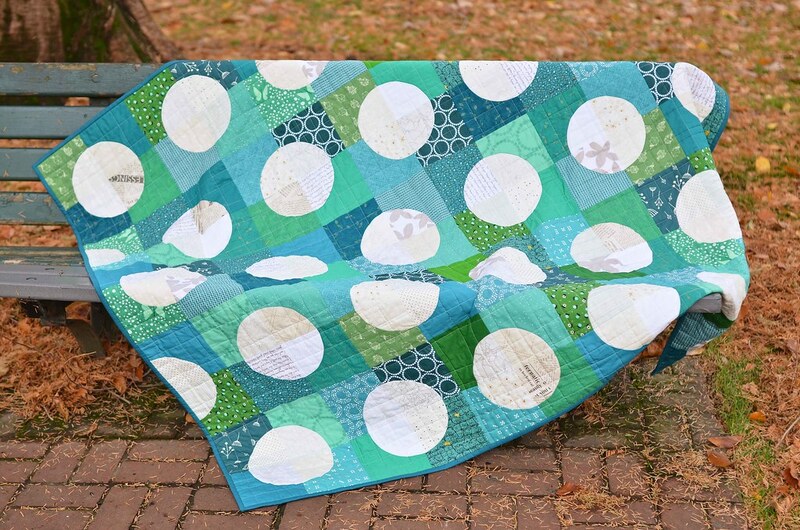 Interested in making your own Polka Dot Quilt? A pattern for this quilt is now available. Read more about it here! My daughter has been asking for a new quilt to add to her bed during the winter. She has plenty of quilts, but can you really have too many quilts? 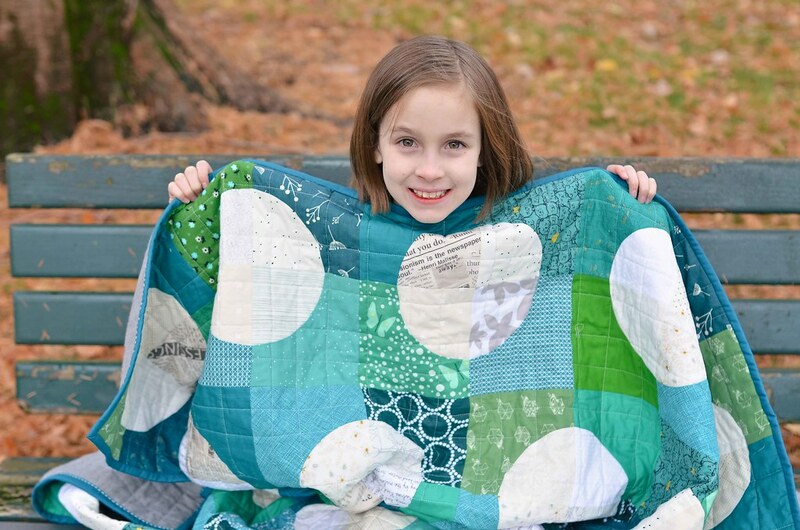 She requested a quilt made with the blue/green/teal/turquoise-ish colors and we pretty much cleaned out my stash with this quilt. I thought it would be fun to do white polka dots, but I think I made them too big . . .? They don't exactly seem very polka-dotty. They are more like giant crop circles. Harper insisted that she loves the quilt anyway and it is now living on her bed along with her Betty Quilt. The backing is a Robert Kaufman Flannel - it's hard to see in the photo but it is a little bit of black, gray, and white mixed together. It's not the girliest backing fabric, but it is so wonderfully textured, super soft, and I wanted something calm since the front is pretty crazy. I hand stitched the binding down using Perle cotton. 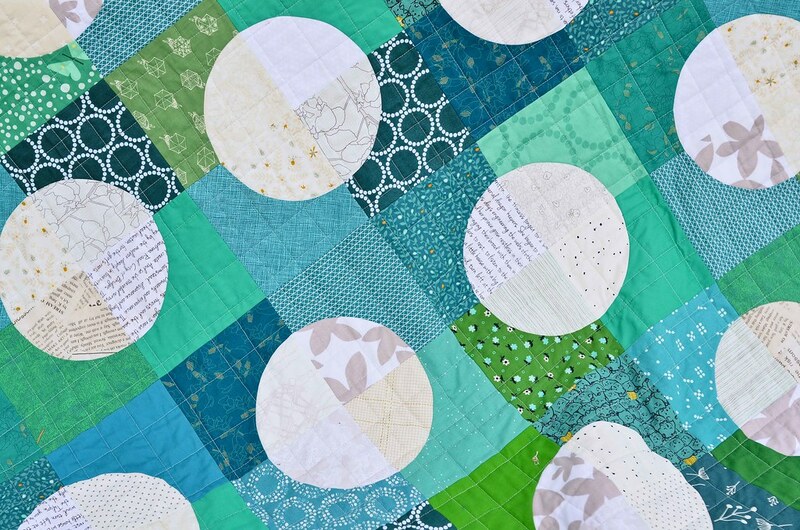 I am thinking about trying the quilt again, but this time with smaller circles. 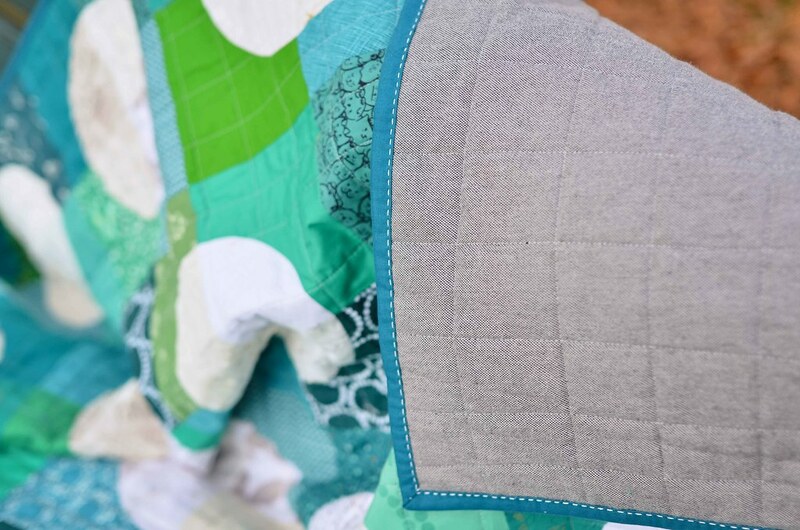 Maybe I will try out a baby quilt version before I invest in sewing all of those curves again! 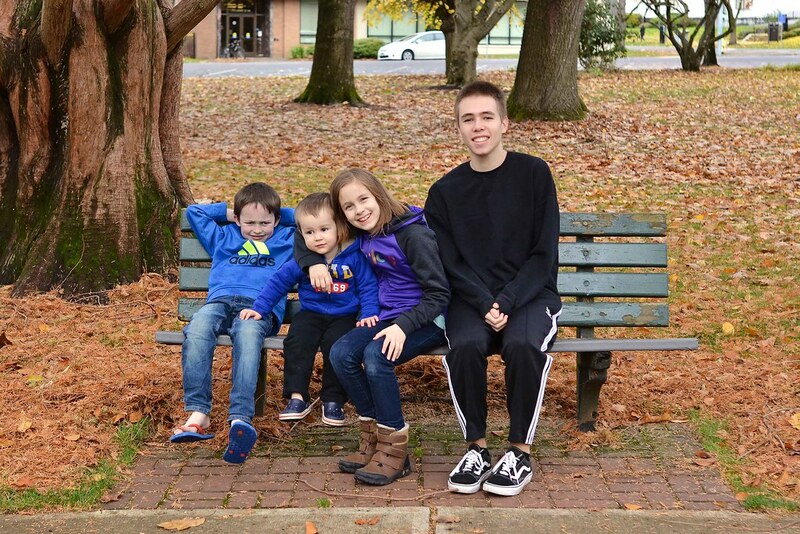 I took these photos at the Oregon State Capitol and got a chance to get a photo of my kids + the French exchange student that we have staying with us. My 7 year old cannot take a normal photo! Thanks! They are my daughter's favorite colors. I like the idea of the circles being moons. 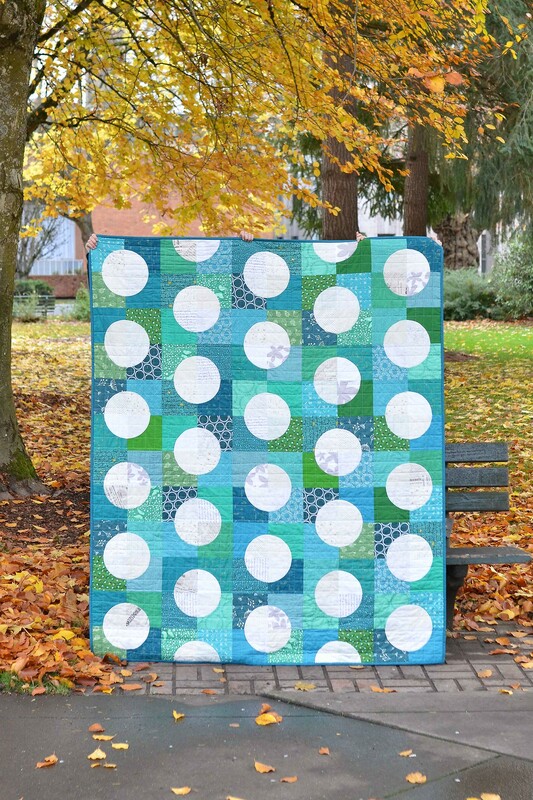 I really like this quilt and I also like the size of the circles. Like Kay, they remind me of moons. Thank you and thanks for the encouragement! Very pretty. I also can't get enough of your signature hand binding - love the look! Thanks! I really enjoy sewing the binding this way. I love the range of footwear! The quilt is cute too nice and simple. Ha ha! I hadn't noticed the footwear. My sons are always hot and my daughter is always cold. Erica, I love this so much. I really like polka dots, and these are beautiful ones/moons. I'd love to have this quilt on MY bed! Thank you, that is the best compliment! 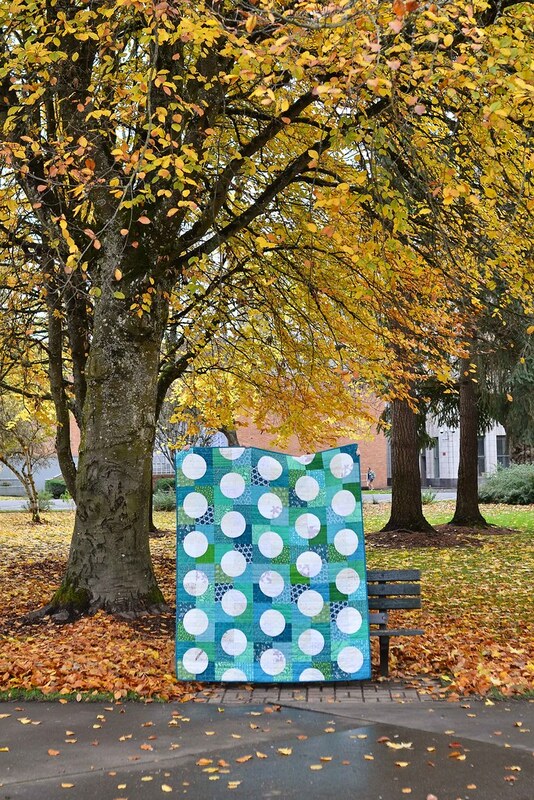 Years ago my mother made my daughter a quilt with polka dots this size. My daughter still talks about playing "Twister" on her quilt. It is a happy memory. I think the size of your dots are perfect! Love the colors. I'm sure your daughter will love it forever. I'm also in the "dots are perfect" camp. It's a beautiful and fun quilt. Thank you! I that it just looked different than I expected, but I am happy with it now. I love this quilt so much! I just learned to piece curves a few weeks ago and I've been looking for beautiful and simple curved quilts. This seems like a great choice! Do you have a pattern for this? I will soon, it is with pattern testers right now. The pattern will have an option for the polka dots like the ones in this quilt or a smaller version. It should be ready toward the end of January.